A WEEKEND AWAY IN A DAY | Culture Attic. With Easter fastly approaching and bringing with it a four-day long weekend, I decided to get out of the city. Limited funds meant I couldn’t venture too far afield and last-minute hire cars were few and far between. With this in mind I decided to hop on a train and head to the second most populated city in Victoria, home of Ford Australia and AFL team The Cats …Geelong. Myself and a few friends caught the train from Southern Cross Station in the early hours of the morning to make the most of our day. Geelong is just an hour away and the train journeys out of Melbourne CBD are always so beautiful. A couple of kilometers out of the city you soon realize how gorgeous Victoria’s landscape is. The vineyards and orchards stretch for miles over the amazingly flat grassy land. Less than an hour passed and we had reached our destination. Walking out of the train station I was overcome with a sense of calm and clearness. No high rises, no traffic and the water was in sight. The weather was perfect. A few clouds in the sky and a slight breeze made walking along Geelong’s waterfront incredibly comforting, reminding me of my days back at the Cornish seaside. 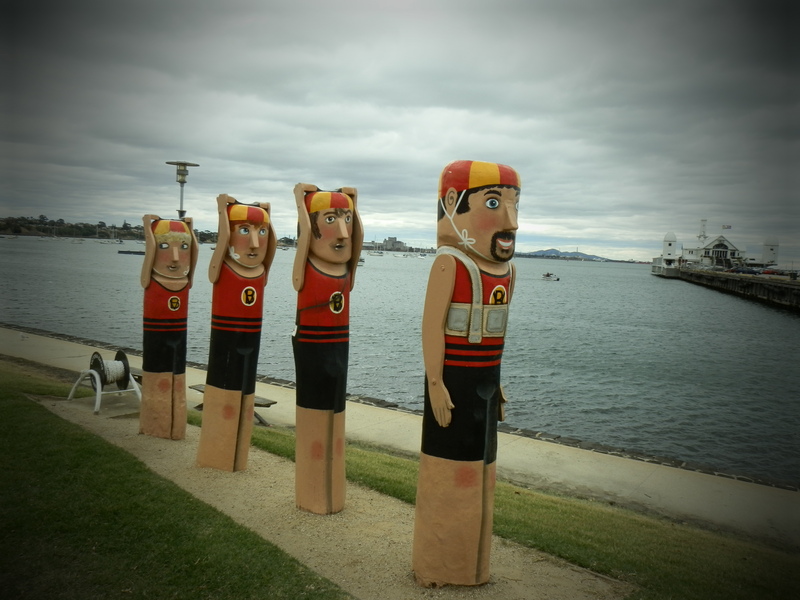 The coastline has been given a real personality thanks to the ‘Bay Walk Bollards’ by artist Jan Mitchell. A total of 104 painted wooden sculptures stand at the water’s edge. 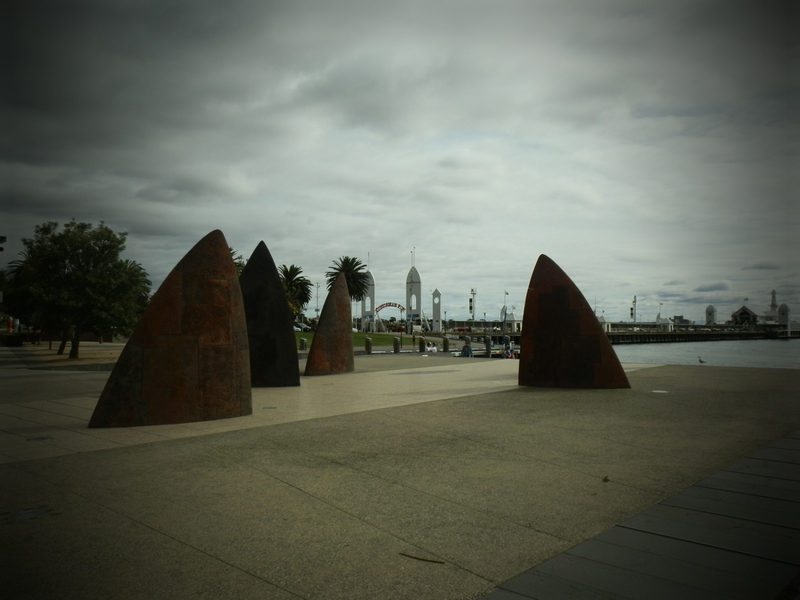 From Rippleside Park to Limeburners Point, the artworks tell a story of Geelong’s history. The sculptures felt incredibly personal which made being a ‘tourist’ here for the day very special. From the Portuguese Explorer to the Volunteer Rifle Band, Jan Mitchell and Geelong City Council have made sure that the history of Geelong and its people stands firmly along the coast. All the walking and discovering made us hungry for some tucker. On a day like this a fish and chip dinner seemed ideal. 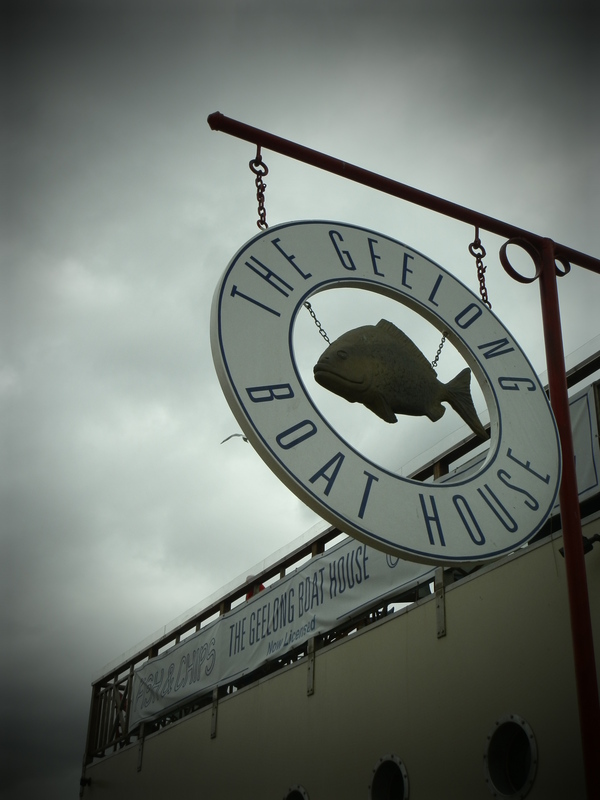 After speaking to a few local residents we found ourselves heading towards the newly revamped Geelong Boat House. This floating barge-turned-restaurant was exactly what I had in mind when I pictured my day at the seaside. Unfortunately for me, mushy peas seize to exist here in Australia but I made do with my flake, chips, lemon and some damn tasty tartar sauce. These days we have become too involved in the fast pace of everyday life that we forget to take a moment, to realize where we are and what beauty surrounds us. Next time you find yourself free from work, escape your everyday surroundings, take a walk and see what you come across.